One of my favourite memories of Christmas when I was a child was waking up to the sight of a bulky stocking that had magically been filled during the night. One year I'd only been asleep an hour before I heard Santa sneak in to leave his gifts (obviously in a rush to get the job done so he could scoff the cookies and guzzle the beer we left him). Of course I jumped out of bed and bugged my littlest sisters to open one... just one... maybe it was four... with me. Far too excitable for my own good really - the presents were never as fabulous as the wonderment and curiosity felt of not knowing what lay within the green, red and gold wrapping paper. Sweets and socks were the general flavour of stocking fillers for me as a kid but now a little older (and not the least bit less excitable) I can fill my family and friends stockings with presents that are a bit more indulgent and eco friendly. - Lavender Eye Pillow by True Earth Organics made from organic lavender and wheat inside an organic cotton bag. 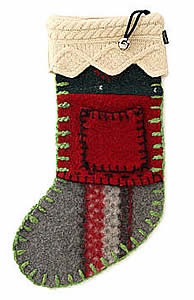 - Organic Lip balms are the perfect size for a stocking!